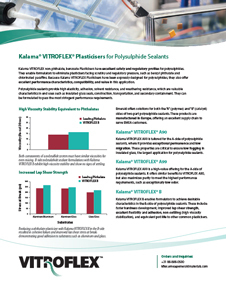 Kalama® VITROFLEX® A90 by Emerald Performance Materials is a benzoate plasticizer designed primarily for use in 2K insulating glass polysulphide sealants. Provides exceptional permanence, low migration and low fogging. Exhibits excellent processing characteristics, pot life, mechanical properties and adhesion. It has excellent compatibility with polysulphide polymers and low volatility. Kalama® VITROFLEX® A90 complies with FDA 21 CFR 175.105, 21 CFR 176.170 and 21 CFR 176.180.